Is there a better alternative to iRooster? Is iRooster really the best app in Music category? Will iRooster work good on macOS 10.13.4? 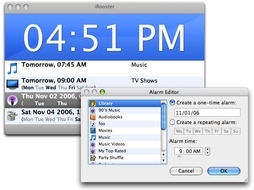 iRooster is a modern, easy-to-use alarm clock for Mac OS X. 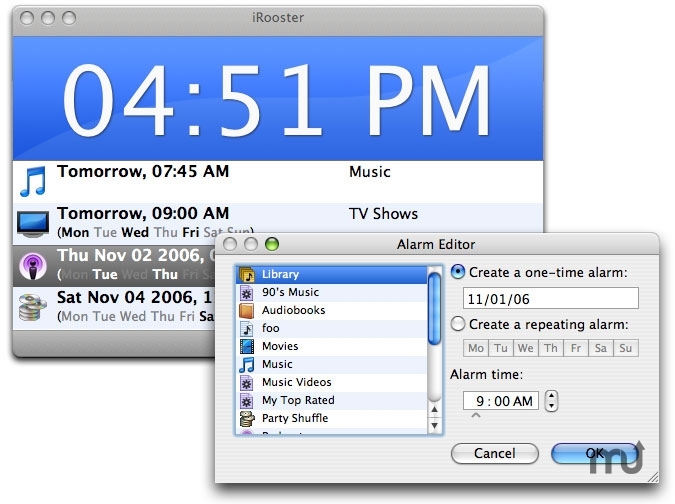 Featuring a gorgeous Aqua user interface and iTunes integration, iRooster is the best way to get up in the morning. Why suffer through radio advertisements when you can wake up to your multi-gigabyte iTunes music library? iRooster allows for a 14 day trial period. iRooster needs a rating. Be the first to rate this app and get the discussion started! Version 2.5.1 adds several fantastic new features: an awesome new icon, a new alarm editor (the first time it's been completely redesigned in 4 years! ), a gorgeous new clock display, and, most importantly, a removal of any dependency on iTunes. Here's what the removal of iTunes means: no more failed alarms when iTunes decides it's time to update itself, significantly lower memory requirements for iRooster, and no chance of iTunes breaking iRooster again after a version upgrade. iRooster 2.5.1 works on both Mac OS X 10.4 Tiger and Mac OS X 10.5 Leopard.